“The Right to Happiness”, this year’s Berlinale motto, is clearly linked to the one most talked about topic in the German media this year: Refugees. Donation boxes for the Berlin Centre for Torture Victims in every cinema, various programmes to help refugees in Berlin, from free tickets to school projects to traineeships, are the concrete ways the Berlinale participates in the effort to welcome refugees. Even George Clooney, star of the opening film “Hail, Caesar!”, has met with Angela Merkel to discuss the situation – together with his wife, the international human rights lawyer Amal Clooney, who might have had more to contribute to the conversation. In any case, no results of the meeting have been made public. But the main way the festival approaches the issue is of course with films. It is rare for a documentary to be awarded the Golden Bear, but to little surprise Gianfranco Rosi received it for Fuocoammare (Fire at Sea). It’s a two-hour-long portrait of the Italian island of Lampedusa. Director Gianfranco Rosi stayed on the island for over a year. He arrived just after over 350 people had died at sea, trying to reach the island. He found Lampedusa empty, no refugees to be seen. So he turned to the local population instead, and found his protagonist, 12 year old Samuele. So, Samuele’s childhood is unaffected by the influx of refugees, he spends time with his grandparents, listening to old fishermen stories. He spends time with his friend, playing outdoors. He goes to school. And he spends most of his time alone, outdoors, firing pretend guns into the sky, climbing trees, conversing with birds. He is a bit of a loner and struggles with different sources of insecurity: He gets sea-sick on his grandfather’s boat, he has to wear a corrective patch and glasses for his lazy eye for a while, and he sometimes feels so anxious he can’t breathe. These scenes are contrasted with truly horrific images of boat rescues. Rosi has gone along to dozens of rescue missions and filmed the arrival of hundreds of badly injured and desolate African men, women and children. The worst, most shocking images are of a boat that turns out to have 150 people in its hulk. They are squashed in there, in the dark, without air supply, many already dead, others in very bad health. The dead bodies are dragged onto the rescue boat. However, Fuocoammare doesn’t quite transport the despair and rage Rosi shows when he talks about it. And this could well be what the film is lacking: A statement. There are terrible images, contrasted with beautiful images, but it’s not really enough to carry a film, especially for two hours. Maybe it’s due to a general feeling of powerlessness, but little Samuele’s innocuous play and personal insecurities have to stand in as metaphors for all that is wrong with the situation. At one point, he and his friend defeat an army of cacti with slingshots and firecrackers, having carved faces into their leaves beforehand. “It’s like he is inventing the enemy to fight. There’s no enemy? Let’s invent an enemy and fight. It’s what we do, you know.”, Rosi explains. Rosi has an aversion to intrude into his protagonists’ lives. So he stays the observer, pretending not to be there, aiming to capture reality with his camera. A similar approach is used by Chinese documentary filmmaker Wang Bing, whose film Ta’ang is shown in the Forum section of the festival, focusing on films from the non-Western world and experimental formats, and is also a story of migration. While, as Rosi says, Europe is suddenly discovering the topic, it has of course been going on for decades, and not only in Europe. 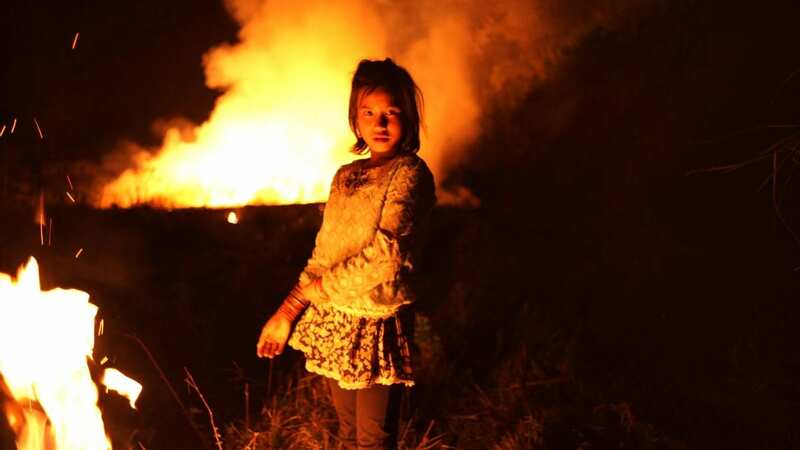 The Ta’ang are an ethnic minority in northern Burma (Myanmar), many of whom crossed the border to China during the 2015 outbreak of the decade-old war between the Burmese military and the Ta’ang liberation army. Another border, another war, another arena of the same story. Unfortunately, we don’t learn about this “forgotten war”, as the festival programme description for Ta’ang has it. Director Wang Bing decided to focus more on the people and their lives during the journey. “I want the audience just to see these real people laugh, talk, and I want the audience to see their gestures, and I believe that these characters, they can speak for themselves. And I believe that that’s how films should be.”, he says, and his film does produce a closeness to these people, an understanding of what it’s like to be on the run, even without knowing their history or background. Not only the documentaries focus on migration. Soy Nero, another Competition entry, is a feature film telling the story of Latino teenager Nero trying to become an American citizen. The Mexican-US border, with its fence, no-man’s-land and border patrols, has long been iconic, and the subject of many films. It does feature in Soy Nero, right at the beginning, but then the story takes a different turn. Nero joins the US Army in hopes of becoming an American citizen, but all he gets is a green card. “I just want to make sure that the next time I’m at a film festival, nobody will ask me ‘what is a green card soldier?’. Then I’ve won the biggest award that Berlin could have given me.”, says director Rafi Pitts. About 40,000 US soldiers are not US citizens, they are the so-called green card soldiers, hoping to become Americans by serving. Many are never awarded citizenship, many even have their green card revoked after their deployment, many are deported. And many die or are wounded at war. Soy Nero has some flaws in the logic of the story, but Pitts does a good job of painting a complex, sometimes comically, sometimes tragically absurd America. Every character Nero meets is a bit crazy, there is some cracking dialogue, which contrasts nicely with the desolate depictions of the various no-man’s-lands and the loneliness that define Nero’s life. Rafi Pitts is himself a migrant, having left his native Iran after the revolution and not having returned there since his 2010 film The Hunter, for fear of repressions. This is reflected in his character Nero, who shouldn’t really be labeled an immigrant, considering he grew up in LA and was only deported later, because he didn’t have American citizenship. Motivations for migration can be manifold. Someone exiled like Pitts might find it hard to believe, but lots of people do leave their home out of choice (among them the author of these lines, along with many EU citizens enjoying their freedom of movement), deliberately getting out of their comfortable surroundings, challenge themselves, make their own way in the world. This motivation is concisely voiced by the protagonist of yet another documentary focusing on migration, also in the Forum section: Those Who Jump (Les Sauteurs). Here, filmmakers Estephan Wagner and Moritz Siebert have given a camera to Abou Bakar Sidibé and asked him to document his life. 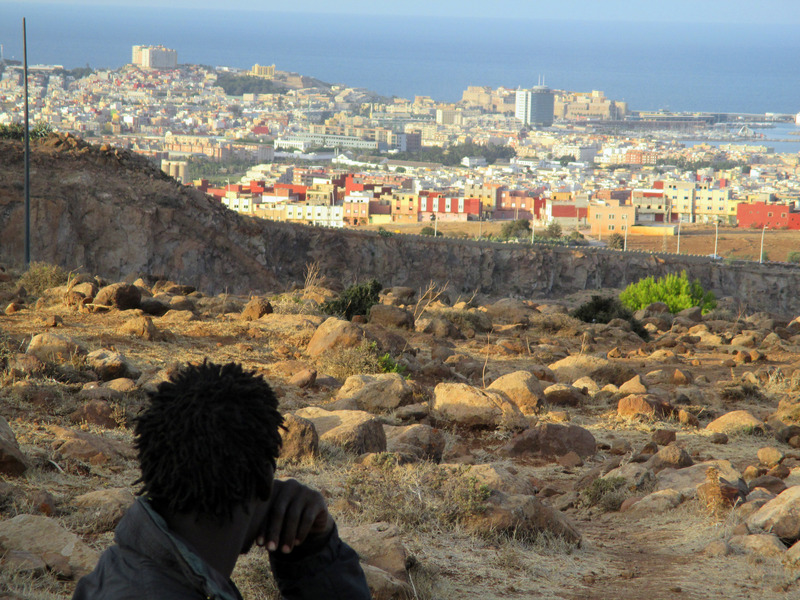 He lives in a camp in Morocco, near the border to the Spanish enclave Melilla, repeatedly trying to jump the three border fences. Of all the migration-focused films, Those Who Jump gets closest to actual migrants. Sidibé is protagonist, cameraman and narrator, and in the course of the film, he takes his role as documentarian more and more seriously, finding a real voice in visual storytelling. He and his companions have soberingly clear-sighted explanations for their attempts to reach Europe: Europe exploits Africa’s natural treasures, so why should they not have the right to participate in European life? They know it’s not paradise that awaits them behind the fence: They know about the crisis and high unemployment in Spain, they know about racism and discrimination. But the pull is stronger. Going back home would be defeat. Even though the crossing is dangerous, and people do die, they make this journey. Even without showing or talking about war or hardship, Those Who Jump makes this choice understandable, and makes a powerful point against the fortification of borders – solely by changing the point of view that we are used to seeing, by letting a refugee tell his own story. It is this man, Sidibé, who carries the film. When Wagner and Siebert watched his material, they realised he had gone way beyond what they had expected. He had made editorial and esthetical decisions that factually made him a co-director, not just a protagonist. With no training or experience, he discovers his talent for filmmaking. Here, the festival’s “right to happiness” materialises: Sidibé starts out as one of the faceless mass of African refugees trying to overcome a fence, and ends up travelling to the Berlin Film Festival as a director, not quite able to believe his luck. Leslie Byron Pitt is a film blogger, podcast host, and aspiring amateur photographer, who works in interior sales.He’s currently working on building his portfolio of works.Leslie studied Film and Video Production at Bucks New University (formerly BCUC). He lives in the home countries. What Cars Would The Disney Princesses Drive If They Were Real?